This image was scanned from the publication - How Firm a Foundation: A History of the Township of Cramahe and the Village of Colborne in Cramahe's Digital Archives (3bk), p.24. 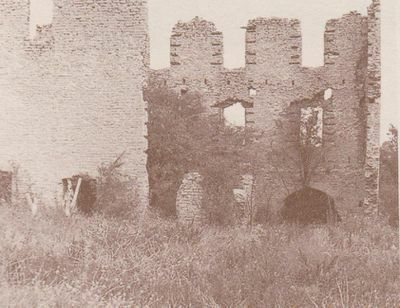 The caption reads: "Ruin of the Old Christie Mill, so called for a miller who ran it. It was built by Joseph Keeler, the first settler, around 1800, just west of present-day Ontario Street. The same limestone was used for Old St. Andrew's Church, Colborne."